Many challenges face the new Computer Science learner. One of the most interesting times for students learning to program is that period after they’ve learned a new feature or programming strategy, but before they’ve had a chance to really master it. The syntax may still be unfamiliar, or the strategy is “the same, but different” as something that they’ve seen before. I first stumbled upon the “Parsons Problem” type of question in a paper by researchers Denny, Luxton-Reilly, and Simon, Evaluating a New Exam Question: Parsons Problems, published in 2008, which led me to Parsons and Haden’s original paper Parsons’ programming puzzles: a fun and effective learning tool for first programming courses. A “Parson’s Puzzle” is a programming problem delivered via computer, in which code fragments, manipulated via a drag-and-drop interface, may be assembled to form a correct, working program. Clicking a “Check” button would provide some sort of feedback. Parsons and Haden proposed that the nature of the puzzle would improve engagement with the topic, provide better structure for students still struggling to understand fundamental logic, strategies, or algorithms, and even intentionally allow for common errors so that a student could get immediate feedback on fundamental misunderstandings. Parsons and Haden’s original idea of helping to teach students with an automated system was adapted to a paper-based means of assessing students by Denny, Luxton-Reilly, and Simon. Along the same lines, it’s certainly possible to use a paper-based strategy of helping students develop and clarify their thinking on any given computer programming topic. In an introductory computer science course taught using Python, students had recently learned about functions, and had had the chance to learn how to use functions in several different contexts. 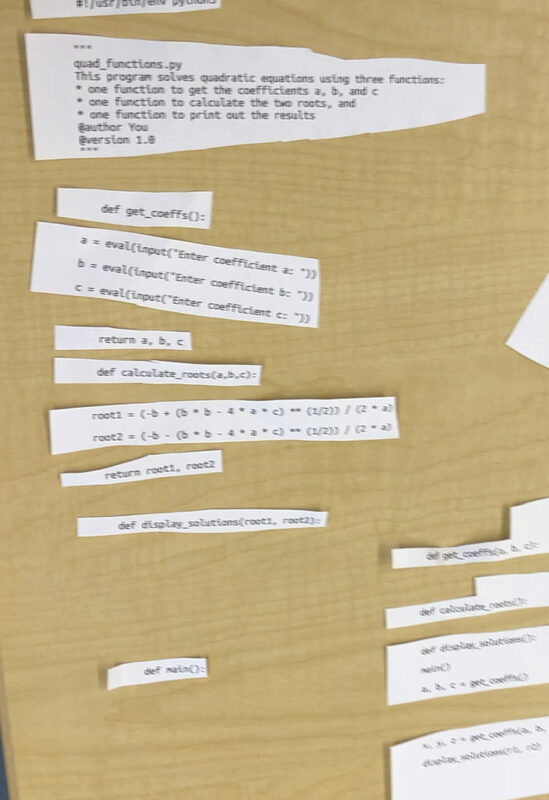 Students were paired randomly and given a paper copy of the activity here [PDF], and asked to a) arrange the lines of code into strips of paper that they would assemble into a working version of the program, and then b) enter their code into the computer to verify that it works as intended. Students took the assignment seriously, and seemed to appreciate the nature of the puzzle, and the fact that all of the information was available to them—they just had to (literally) put the pieces together. There were some lively discussions—”Do we need a function header with parameters or not? Do we need the function to return a value or not?”—as well as a desire to get done with the puzzle-solving as quickly as possible in order to move onto entering the code into the computer to test their program. For a larger assignment or project with many variations, the Parsons approach is not well-suited: there are too many variations that need to be considered. For students just learning to master a new topic, however—functions, conditionals, while-loops, for-loops, etc—the Parsons Problem strategy is a great way to build students’ skills and confidence in programming. Paul Denny, Andrew Luxton-Reilly, and Beth Simon. 2008. Evaluating a new exam question: Parsons problems. In Proceedings of the Fourth international Workshop on Computing Education Research (ICER ’08). ACM, New York, NY, USA, 113-124. Dale Parsons and Patricia Haden. 2006. Parson’s programming puzzles: a fun and effective learning tool for first programming courses. In Proceedings of the 8th Australasian Conference on Computing Education – Volume 52 (ACE ’06), Denise Tolhurst and Samuel Mann (Eds. ), Vol. 52. Australian Computer Society, Inc., Darlinghurst, Australia, Australia, 157-163.